All change as the new Rotary year begins. On a perfect summer evening with the South Lakes mountains bathed in glorious sunshine we held our 2018 Club Changeover at Barrow Golf Club. 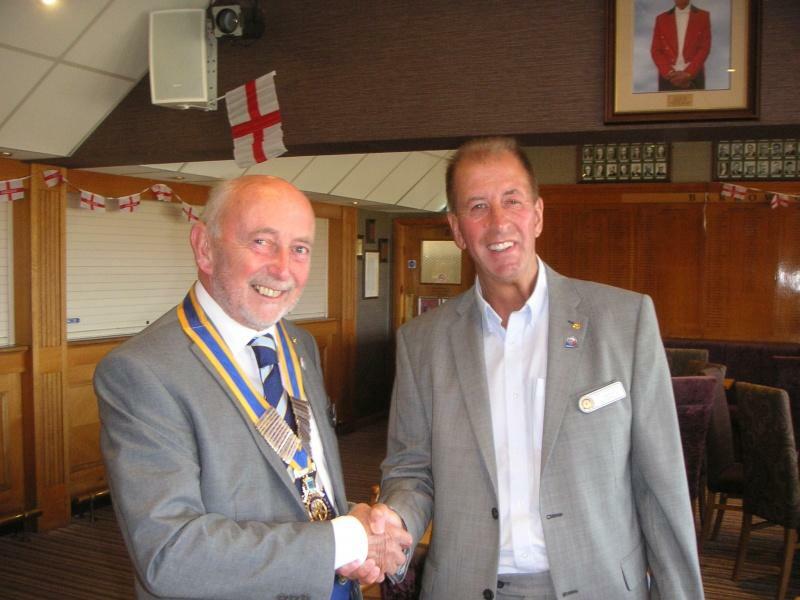 President Gordon opened the meeting and then relinquished his chain of office to our new President Colin who reciprocated by giving Immediate Past President Gordon his PP jewel. President Colin then gave President Elect Brian his collarette, he will induct our new President Nominee at a later date, our new PN was unable to be present having a prior commitment at the Town Council..
Colin said he was very proud to be our 27th President, he said that looking back on our history he had some big shoes to fill but hoped to bring something different, perhaps less formality. He wanted to project our image as having fun as well as fellowship and as an incomer appreciated the circle of friends our club has given him. He said he hoped that we would be able to look forward to some additional social gathering, not all centred around beer, one of his great loves ! Look forward to our 27th year and trust that President Colin will BE THE INSPIRATION we all seek !